Depending on the type of products that you manufacture, you and your employees can encounter a variety of airborne hazards. Most of us know that we should wear some type of air respirator in many of our work environments. What can be difficult is identifying the particular hazards and determining what protective equipment. Dust from Power Equipment. If your employees use power equipment, such as an angle grinder, router or jig saw, they can generate a cloud of dust. Long-term exposure to dust from sawing and sanding wood can cause a range of health issues, including allergic respiratory reactions and lung cancer. Welding Fumes. Welding not only generates particulates but can give off harmful fumes which can lead to a variety of ailments, including cancer. Adhesive Removers. Vapors from some types of adhesive removers can affect your nervous system and make you sick. Solvent Fumes. 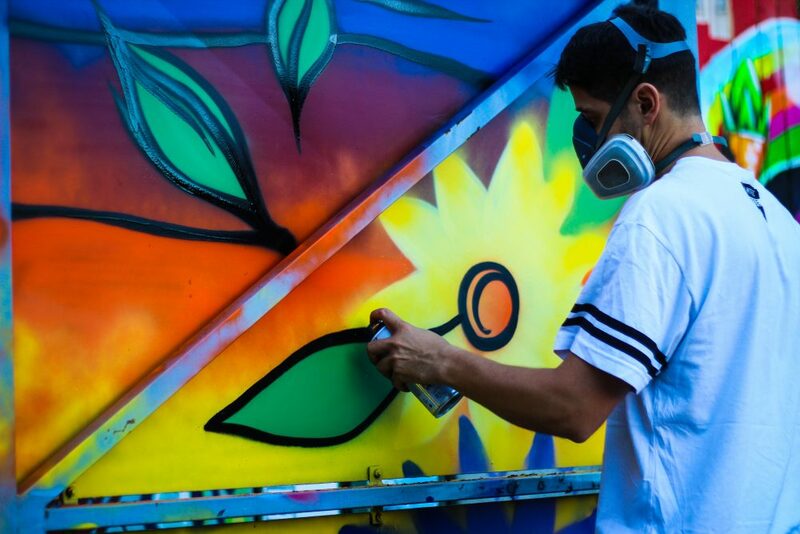 Breathing solvent fumes from airbrushing and spray painting not only can make you dizzy but what’s worse is that protracted exposure can result in liver damage. Breathing Problems. The most severe breathing problems, such asCOPD, may not surface until many years after a worker has been subjected to the hazard. (It may interest you to learn that one of the major causes of COPD for those who have never smoked is occupational exposure to dust and chemicals.) While medical treatments have improved for some patients experiencing chronic respiratory disease, these are the type of problems that will usually last your lifetime. If you are exposed to airborne health hazards, you should wear an air respirator. Some of the most popular types are air purifying respirators, which filter contaminants from the air. 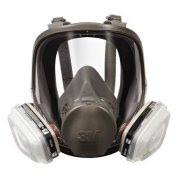 Other types of respirators provide the wearer with fresh air. 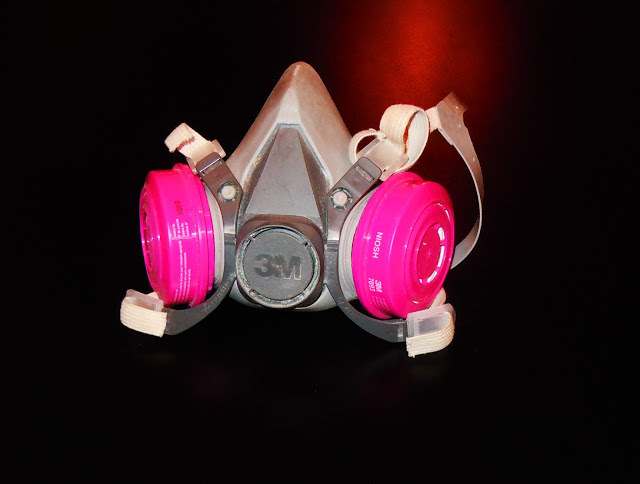 Three types of air purifying respirators are dust masks, half mask respirators and full face respirators. In light of the potential risks to your employees, you may require your employees to wear an air respirator on the job. If you do, OSHA demands that you establish a respiratory protection program for your shop. Other federal and state agencies have issued very specific regulations covering the selection, use and maintenance of the appropriate air respirator for the work that your employees are performing. Step One: Develop a Program. Establish a written respiratory protection program. You should update your written program as conditions change in your shop. These conditions could include the use of new materials, such as solvents or adhesive removers, the addition of new equipment or the introduction of new manufacturing processes. Step Two: Assign an Program Administrator. Assign management of your program to a qualified employee trained in respiratory hazards. While this does not mean that you personally need to conduct the training sessions, as a shop owner you just need to provide the training. To aid training, OSHA has developed several training videos, which you can use. Step Three: Identify the Hazards. Airborne hazards will vary from one type of shop to another. Your responsibility is to identify and evaluate the hazards in your shop. When using raw materials, such as paints or solvents, you should read the manufacturer’s Safety Data Sheets (SDS)and product labels to learn about any health hazards associated with product use. In some cases, these SDS bulletins may include air respirator recommendations. You can also call the manufacturer, when you have questions. Step Four: Select Appropriate Respirators. After identifying any hazards related to specific applications, you need to select the appropriate respirators and filter cartridges for your employees. As an employer, you will also need to establish a schedule for changing cartridges. Step Five: Provide Training. Provide employees withrespiratoryprotection training covering how to put on and remove a respirator and how to clean and maintain their respirators. This training should be outlined in your written program. Step Six: Maintain Respirators. To work properly, you and your employees must maintain your respirators according to the manufacturer’s product bulletins. Maintenance procedures, which should be explained in your written respiratory protection program, should cover inspection, cleaning and storage of equipment. You should clean and inspect respirators at the end of every shift and store them in enclosed containers or plastic bags. Damaged respirators, such as those exhibiting cracks, must be replaced. Over time, filter cartridges will become clogged with contaminants. When this happens, breathing through the respirator mask will become difficult. This is a sure sign that you should change the filter cartridge. Another clue that a filter cartridge is not working is when you can smell or taste a vapor or when you become nauseous or dizzy. Irritation of your nose or throat also indicates that you should change the cartridge. Step Seven: Access to Records. Provide your employees with access to all records pertaining to your written program. Step Eight: Conduct Worksite Specific Training. In directing employees, it usually is a good practice to explain what jobs need to be done that day and what personal protection equipment is required to do that job. Then it is up to you, if you are the supervisor, to make sure that your employees follow the safety guidelines. When they don’t follow the rules, then you need to take corrective action. Step Nine: Fit Testing. Provide employee to be fit tested with any tight fitting respirator selected for their use. This is important, because if the mask does not fit tightly contaminants can leak past the seal. A number of factors can affect how well a respirator mask fits on your face. The most obvious variable is the shape of the wearer’s face. If one type of mask does not fit an employee properly, you need to find one that does work. Other factors can compromise a tight seal including facial hair, piercings, scars, glasses and jewelry. Fitting, which includes qualitative and quantitative (measurable) testing, should ensure a proper fit. When you perform fit testing, you must conduct the test under the exact conditions in which the mask will be worn. That means that you must conduct the test using the same make and model that your employee will use. What’s more, if your employee wears glasses or jewelry, you must conduct the test as he or she is wearing these items. Employees must be retested every 12 months. NOTE: The loose fitting type of respirator, such as a respirator hood or helmet, does not need to be fit tested. Step Ten: Annual Medical Evaluation. Air-purifying respirators, which utilize filtering cartridges or canisters, can make breathing more difficult. This added stress creates an increased risk for any employee dealing with an existing health issue, such as heart problems. For this reason, if you require an employee to wear a respirator, OSHA regulations oblige you to provide him or her with an annual medical evaluation. When you are sawing, grinding or sanding, you can generate a dust storm. The tiniest of these airborne contaminants are the most hazardous, because they settle in the bottom of your lungs and do the most damage. The simplest type of air purifying respirator is a disposable cloth dust mask that fits over your mouth and nose. 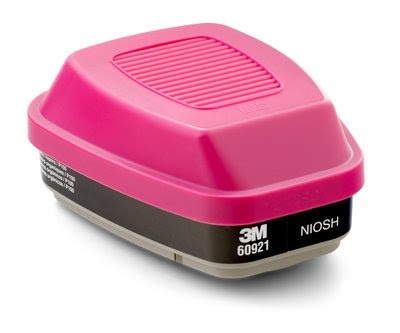 A NIOSH-certified N95 respirator is acceptable for many applications. These masks are only designed for one use and should be discarded at the end of a work shift. A much better choice is to wear either a half mask respirator or full face mask with a particulate filter, which provide a better seal so there is a lower risk of contaminant leakage. Half-facepiece respirators provide many advantages over a dust mask. It fits tighter onto your face so the risk of contaminants is reduced. It accepts a variety of filter cartridges, so you can use it to filter dust as well as gases and vapors. Half masks can also be reused after cleaning. Soft hypoallergenic face piece is very comfortable even for extended use. Snug fitting for secure protection compared to cheap dust masks. Versatile. Great for sanding, grinding or painting applications when used with approved cartridges and filters. Affordably priced for any budget. Provides both eye and respiratory protection. Accepts a variety of bayonet type filter cartridges. Replaceable film covers protect the clear plastic facepiece from overspray. Fits securely to many wearers with facial hair. There are two different types of filters. One type filters solid particles. The other type is a chemical cartridge, which filters gases. Cartridges are labeled and color-coded for easy identification. Some cartridges can be stacked one on top of another to filter multiple types of contaminants. 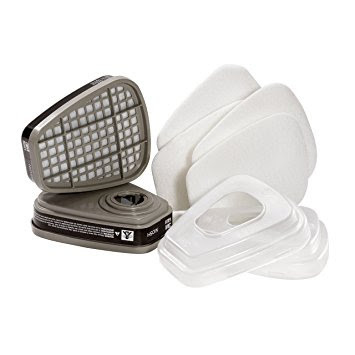 If you purchase a reusable face mask, a wide variety of filter cartridges are available. You must use the appropriate cartridge for specific applications, such as grinding, welding or spray painting. Cartridges for particulates will filter dust, but they will not protect you from vapors, when you are spraying paint or cleaning with solvents. By conducting a thorough hazard assessment of your shop environment, you can determine which types of cartridges should be used. There are different types of particulate filters. The National Institute of Occupational Safety and Health (NIOSH) has developed a rating system for particulate filters. This rating is comprised of a number and a letter. The number indicates how much of particulates the cartridge or dust mask filters. The number 95 means that the cartridge filters 95% of the particulates in the air. 100 indicates that virtually 100% of the particulates are filtered. The letter in front of the number tells you what type of particulate is filtered. N means non-oil proof. R indicates that the filter is oil resistant up to 8 hours. P is for oil proof past 8 hours. P100 cartridges filter both oil and non-oil based particulates. These are ideal for woodworking and welding applications. An excellent filter choice for welding applications. Filters oil and non-oil particulates. Reduces nuisance odors from organic vapors. Satisfies NIOSH P100 standards, providing 99.7% filter efficiency. Bayonet design is compatible with many 3M half and full facepiece designs. For airbrushing or spray painting with some paints, you will need to buy an organic vapor (OV) cartridge. These cartridges include a layer of activated carbon, which absorb certain organic paint and solvent vapors. The OV cartridge should be used in conjunction with a particulate filter. OV cartridges with a carbon filter have a limited life. This life expectancy varies on several factors, such as relative temperature and humidity, breathing rate, type of chemical vapor and the concentration of the chemical vapor. For example, ambient humidity above 85% can cut the service life of an OV cartridge in half. One rule of thumb is if you can smell a vapor while wearing your mask, it is time to change the cartridge. Typically an OV cartridge will last 30 to 40 hours or 30 days, whichever comes first. As long as the OV filter is exposed to the atmosphere, it continues to absorb gases and vapors. For this reason, when you are not using your air respirator mask, always store the OV cartridges in either an airtight container or a zip-lock type of plastic bag. For your shop, you should establish a change-out schedule for replacing OV cartridges. This schedule should be part of your written respiratory protection program. As a word of caution, if you are spraying urethane paint, carbon filters will not protect you from the dangerous isocyanates in the paint. For this type of paint, you need a different type of respirator. Instead of filtering contaminated air, these respirator supply the wearer with clean air. Spraying urethane paint generally requires a spray booth and an airline respirator that provides clean air from an air cylinder or pumps clean air from outside a paint booth through a hose to the wearer. OV cartridges also do not provide protection from vapors and gasses, such as ammonia, chlorine, hydrogen sulfide gas and sulfur dioxide. Organic Vapor cartridges protect against gases and vapors, but will not filter particles. The solution is to use a pre-filter. The 3M Paint Respirator Supply Kit includes replaceable pre-filters for particulates and retainers that fit over the 6001 filter cartridges. This kit is a good selection for painters. 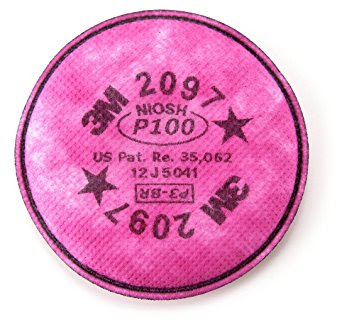 The 3M Paint Respirator Supply Kit consists of two 6001 OV cartridges, 2 pair of 5P71 particulate P95 filters along with a pair of 501 retainers. Another option is to select a 3M Organic Vapor Cartridge/Particulate Filter, which combines an OV filter with a P100 particulate filter. The particulate filter cartridge strains any oil and non-oil particulates. The Oganic Vapor cartridge filters certain solvent vapors. This type of combination filter is a good choice for spray painting or airbrushing applications. Protects against certain organic vapors and particulates. Covers several applications to reduce your inventory. 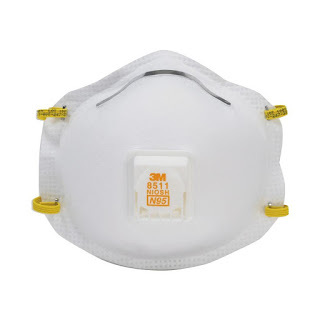 Compatible with many 3M half and full facepiece respirator masks. Bayonet fitting allows for easy installation.